ULR3 solution was expressed in ITRF2005 using GPS data from January 1997 to November 2006, whereas the previous solution (published in Global and Planetary Change) was expressed in ITRF2000 over a shorter data span. ULR3 was included in the IGS contribution to ITRF2008 realisation. Wöppelmann G., C. Letetrel, A. Santamaria, M-N. Bouin, X. Collilieux, Z. Altamimi, S.D.P. Williams, B. Martin Miguez (2009) : Rates of sea-level change over the past century in a geocentric reference frame. Geophys. Res. Lett., 36, L12607, doi:10.1029/2008GL038720. Please cite this article if you find the results useful. More details on the GPS data processing strategy can also be found in the IGS-like ULR analysis centre form associated with this solution. The ulr3_detrend.zip file contains individual station data files of weekly position time series residuals in ITRF2005 with respect to the linear long-term combined solution (given in the header in cartesian and geographic coordinates) at the central reference epoch. The format is straightforward. Residuals are expressed in metres in the local frame (North, East, and Up). The velocities are also provided in the header. The cgpstg_ulr3.kmz file shows a Google Earth presentation of the above weekly data files by cliking on a station symbol. The associated IGS-like sitelog can be accessed too, as well as a view of the position time series in the vertical. 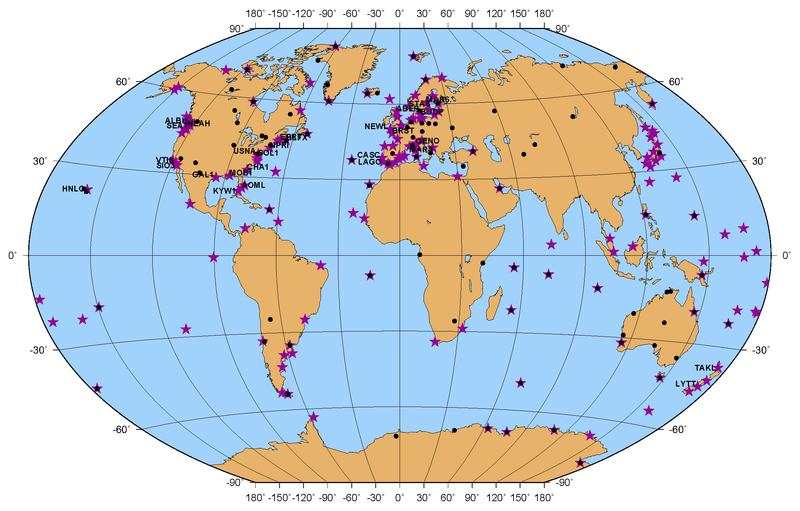 The cgpstg_ulr3table.txt provides the vertical GPS velocities and noise characteristics for the 180 stations fulfilling the criteria of 3.5 years of minimum length with more than 70% of valid data in the time series. Indeed, the errors given in the previous files are formal errors. To assign more realistic uncertainties on the GPS velocities, the noise content in the position time series was examined by the maximum likelihood estimation (MLE) technique using CATS software.